Random thing number 1. I can be a neatness freak at times. I've noticed nobody's vacuumed the studio in awhile. So while the songs were playing today I was picking up specks of this and that from the floor. I found several fingernail clippings. That's it. My faith in humanity is over. People are idiots. Random thing number 2. I was out scouring campus for a sandwich or something, and I ran into a student from a few semesters back. He asked me for a hug. How about that? Faith in humanity restored. The screeching tires were a propos again today. I think my limo came to a screeching halt outside the doors of the studio and my security detail ushered me in at 10:00 on the dot. I had some Oscar Peterson spinning right away, as if nothing. That's how I roll. Freeform radio, baby, by the seat of one's pants, whatever that means. Jim Dandy repeats as Cover Contest winner, edging out Mary Ellen and Nick, who tie for second. 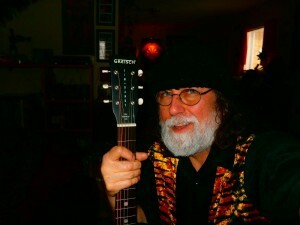 Dandy, with his "Jim Dandy" acoustic guitar. 1. What's the tune, whose tune is it, and which guitarist is covering it? - "Surfer Girl," Beach Boys, Bill "the Frizzilator" Frisell. 2. Matt Wilson and the gang played a holiday tune. What's the title? - "I'll be Home for Christmas." I'm working on this for the Christmas recital, by the way. 4. We heard two versions of a tune called "Hidden Shame." Who are doing them, and which is the cover and which is the original? - Elvis Costello, Johnny Cash. Elvis did the original; and the Man in Black, the cover. I can't believe I missed the Tweedy cover, He's my man!